Home » How much lux does my room need? “I think to offer to warehouse and factory side your Pioneer LED Linear High Bay Lamps. Not needed to change one to one, better if offered qty is less than existing. Please check with what power Pioneers are optimal? To office areas we need to offer 595×595 panels (total 60pcs). Please check with what power panels will be optimal. The above words are taken from one of our clients who ask us to make a lighting solution for his project. The client requires 550-600lux on 900mm height for office room and 500lux on 1-meter height for the warehouse. Why is the lux requirement different? This is the point that we are going to talk about today. Lighting in our living and workplaces is critically important for our ability to accomplish tasks efficiently and safely. In addition, proper light levels prevent eye strain, which allows us to work comfortably for longer periods of time. There are two main concepts that architects need to understand as they plan lighting in their buildings: Light Levels and Lighting Power Density. Since we are concerned mainly with accomplishing tasks in our buildings, we need to understand the Illuminance, or the amount of light that is hitting a surface. In an office, we might want to understand the amount of light that is hitting our desk; however, in a gymnasium or corridor we may be more interested in the amount of light hitting the floor. Illuminance is measured in foot candles (FC) or lux. 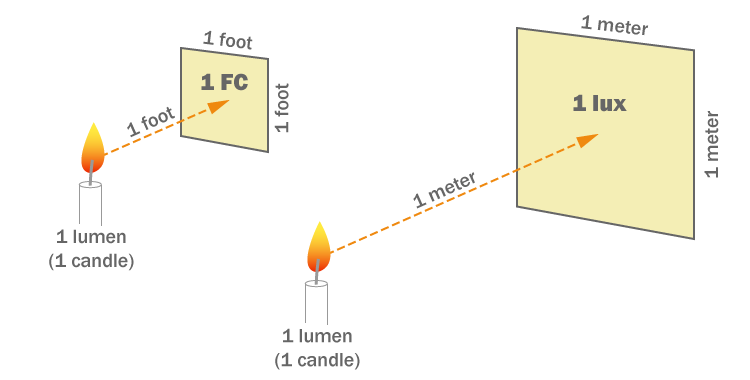 1 FC is the amount of light that hits a 1 square foot surface when 1 lumen is shined from 1 foot away – this equates to 1 lumen per square foot. 1 lux is the amount of light that hits a 1 square meter surface when 1 lumen is shined from 1 meter away – this equates to 1 lumen per square meter. 10 lux is roughly 1 FC. We need to provide enough light to allow people to accomplish see their tasks, but not so much light that it is hard to see the tasks – over lighting is just as bad as under lighting. Detailed tasks like drafting require more light, while general tasks like walking can be accomplished with less light. The most cited reference for lighting levels is the IESNA Lighting Handbook, which is published by the Illuminating Engineering Society. The lighting levels listed below come from the Handbook as well as various other lighting references. Lighting power density is the amount of power used by lighting per unit of building area. In the United States, LPD is measured in watts per square foot. Included in the watt measurement is all power consumed by light fixtures, ballasts, controls, transformers, etc. – essentially, if the component or device is involved in lighting, it must be included in the calculation. Lighting power density is established by local and international codes. The values listed below for LPD come from the 2015 version of the International Energy Conservation Code (IECC 2015). Please keep in mind that certain cities or states may have codes that require LPDs to be a certain percentage BELOW the IECC. Always make sure to check your local codes before establishing LPD criteria for your project. There are two ways to calculate the lighting power density. The first way is to use an LPD that applies to the full building based on the type of building (school, museum, office, etc.) — this method is very basic and is called the Building Area Method. The second way is to calculate the LPD based on each specific room and is called the Space-by-Space method — this method is much more accurate and may result in a lower LPD number, which is helpful when applying for utility incentives. Many utility incentive programs require the design team to improve upon the lighting power density baseline required by local codes. For instance, a utility incentive program may require a 15% (or more) improvement over the baseline LPD in order to receive a lower electricity rate. Please keep in mind that this chart is not comprehensive. The IESNA Lighting Handbook has pages and pages of various categories. If you have a very specific need, we recommend further research. Now you should know the importance of choosing a proper light level for your project. If you still not quite sure about the light level you need, please consult us for a better solution. To make a Dialux lighting simulation, we need you to provide also the measurement of the room(length, width and height), lux requirement(or the purpose of the room), lamp installation height. We focus on the industrial lighting solution with different kind of LED High bays and high power LED corn bulbs. If you have any need of these lights, please contact us soon!